The Strozzi Palace is currently hosting a wonderful art exhibition under the title "The Springtime of the Renaissance" (La Primavera del Rinascimento. La scultura e le arti a Firenze 1400-1460. Palazzo Strozzi.). 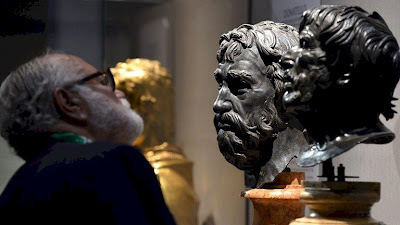 Everyone with an interest in the history of art, especially Renaissance art, should seize the opportunity to spend half a day (or a whole day) at this exhibition here in Florence or, from September, at the Louvre in Paris, if they possibly can. Every year there is a very good exhibition at the Palazzo Strozzi, but this year (2013), the Bargello and the Louvre have put together a truly fabulous show of early Florentine masterpieces displayed alongside equally beautiful Classical and late Gothic works of the kind from which the Florentines drew inspiration. The modern, the renaissance and the classical - a study in character. The creators of this exhibition suggest that it was from sculpture more than painting that the Renaissance sprang, and they see the initial glimmer in the form of the two bronze relief panels submitted in 1401 by Brunelleschi and Ghiberti for the competition to create a set of new bronze doors of the Florentine baptistery. Sculpting scenes based on an identical biblical story, both artists combined Gothic elegance of costume and scenery with human figures inspired by classical sculpture. From this point on, the exhibition is dominated by the sculpture and spirit of Donatello, who did his apprenticeship in the workshops of Brunelleschi and Ghiberti. Donatello strongly influenced his contemporaries, both sculptors and painters, among whom we may count Michelozzo, Masaccio, Filippo Lippi, Paolo Uccello and Andrea del Castagno, stylistically and through his introduction of perspective in his low relief works. - Donatello's St George and the Dragon in very shallow relief. 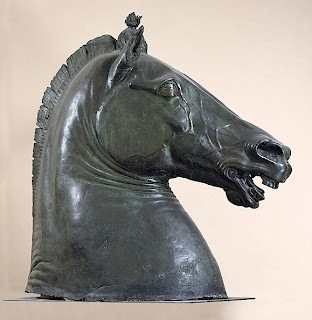 The spatial organisation of the exhibition is excellent, not least with the placement of a huge, 4th century BC, bronze horse's head, the Medici Protome, visible through an arch from the first room of the show. Later, when we enter this room, Donatello's Carafa Protome, is revealed, and we can easily see why it was long thought to be a classical work. Donatello or ancient Greek? Visit this exhibition to find out which! Painters set out to make their paintings more sculptural. More about La Primavera del Rinascimento. 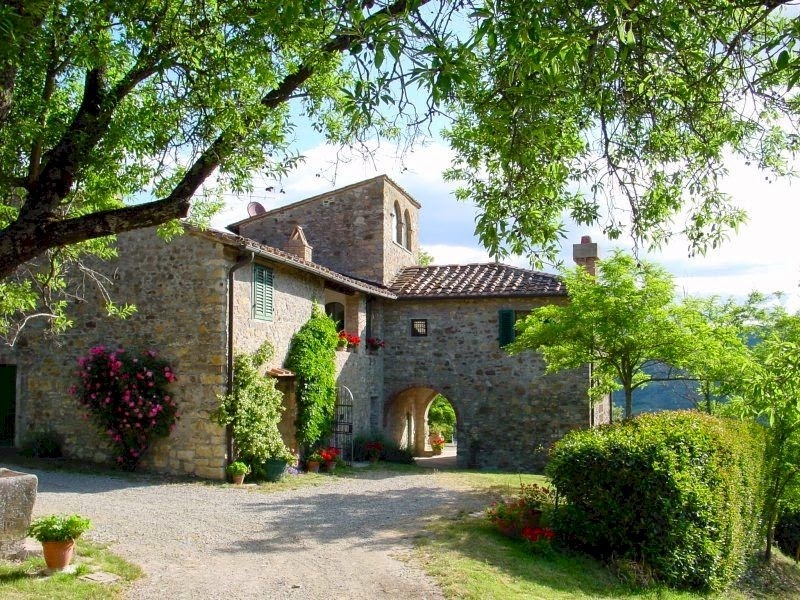 Recommended vacation accommodation in Chianti towns, villages and countryside. All content copyright © ammonet Web Site Promotion 2012 - 2013. All rights reserved. Share my blog with all of your friends! When do the poppies appear in Tuscany? The Mercato Centrale in Florence is not the same as the San Lorenzo Market! The new Googleplus layout is terrible. I began academic life as a biologist with an intense interest in anatomy. Through my skill as a scientific illustrator, I moved more and more towards the study of art history and finally of all aspects of the history of art and architecture in Tuscany and Umbria. This was the 'eureka moment' - history became my passion! At the University of Zurich, I specialised in this field and have continued to do so ever since. Since joining ammonet InfoTech as a content researcher, I have had the opportunity to present condensed summaries of many aspects of my field to the internet public along with articles on interesting aspects of life in Tuscany and Umbria. Copyright ammonet InfoTech 2010 - 2019. All rights reserved. Watermark theme. Powered by Blogger.